I was inspired by this photo from anthropologie! I saved it to my Holidays board on pinterest last week because it was so gorgeous. Using multiple garlands and natural colors and wreaths along with string lights really made this dining room ignite. 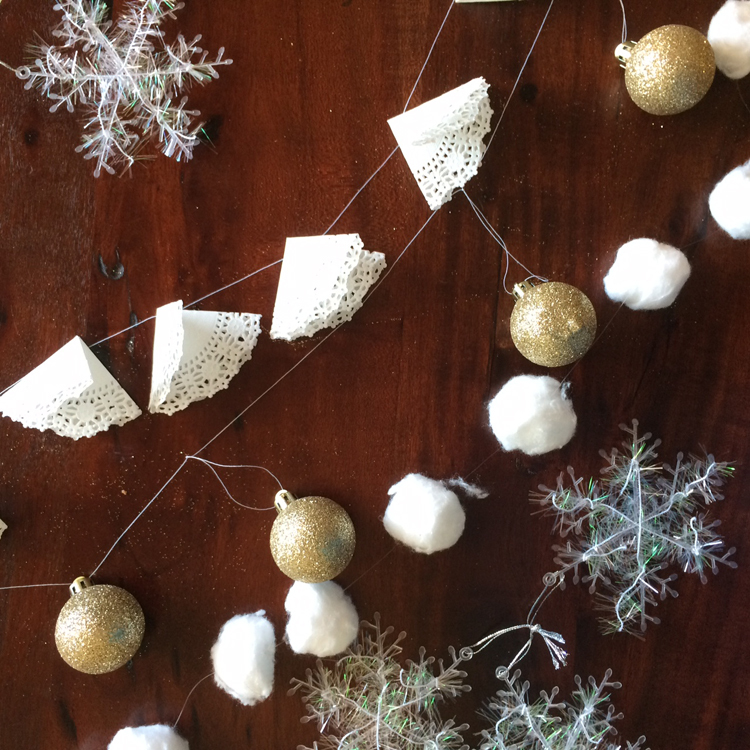 I decided it would be fun to have the kids help make DIY garland in different textures but mostly in the same color scheme of gold and white. 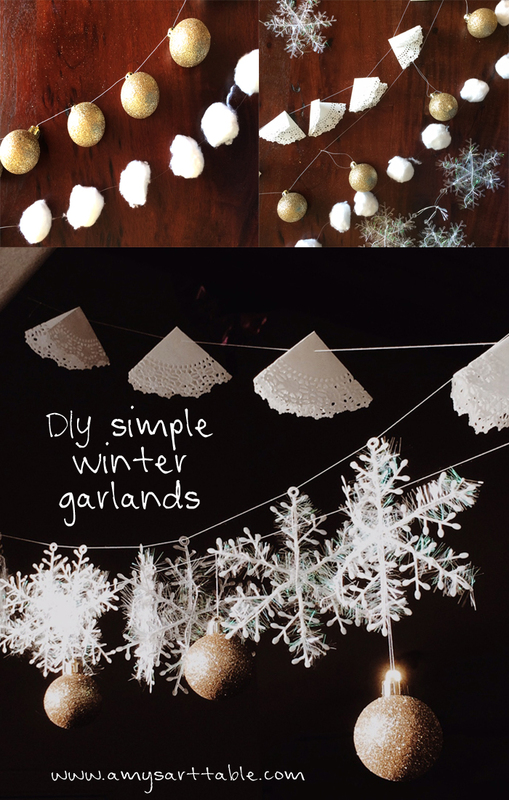 I wanted to use these DIY garlands to hang as the backdrop to our Christmas tree. 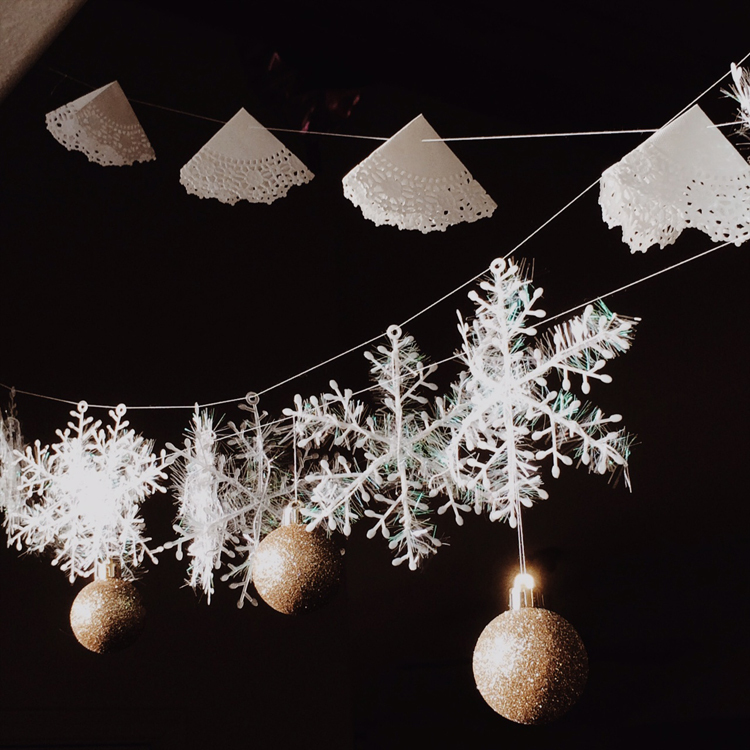 Made of really simple items and very easy to put together, the garlands turned out great. 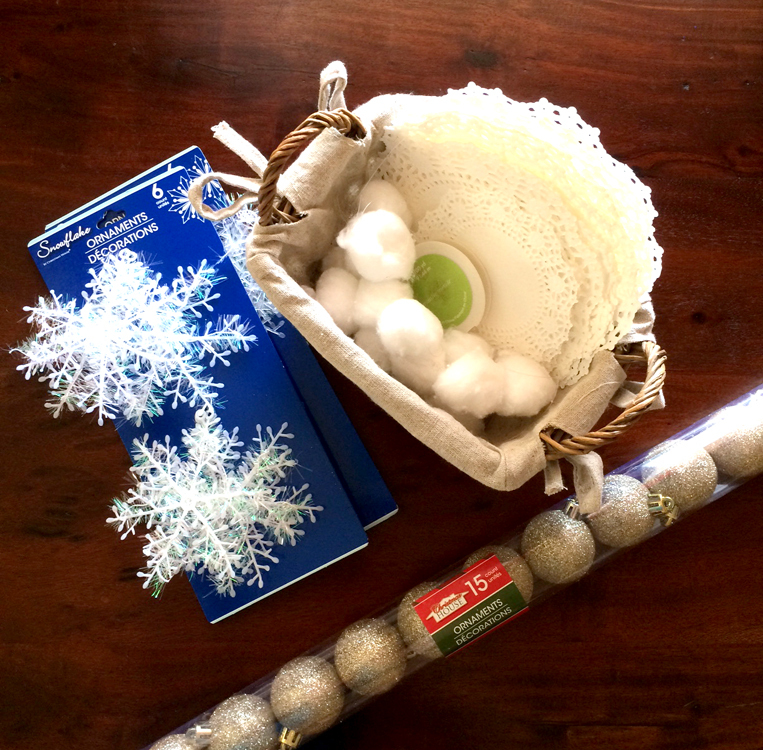 All of the supplies can be picked up at the dollar store or local drug store which makes it a really affordable and practical decoration to share with your family. I think in total I only spent $5 for this whole DIY garland project! I used the same basic process on three of these DIY garland strings; the exception was the doily garland which required a bit of folding. I started out by threading the needle in my desired thread, I used white on most of my garlands because I ran out of my clear acrylic thread after the first garland. Both look good so it really is just up to your preference. 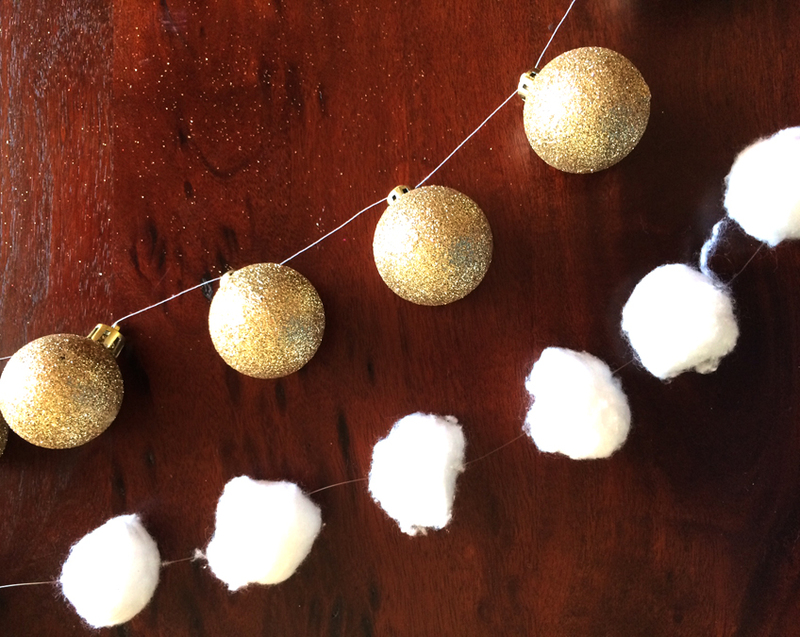 After I threaded the needle I just began to string on the cotton balls, snowflakes, or ornaments. If you want them to stay in one place in an orderly fashion all you have to do is knot them in place after stringing them on. 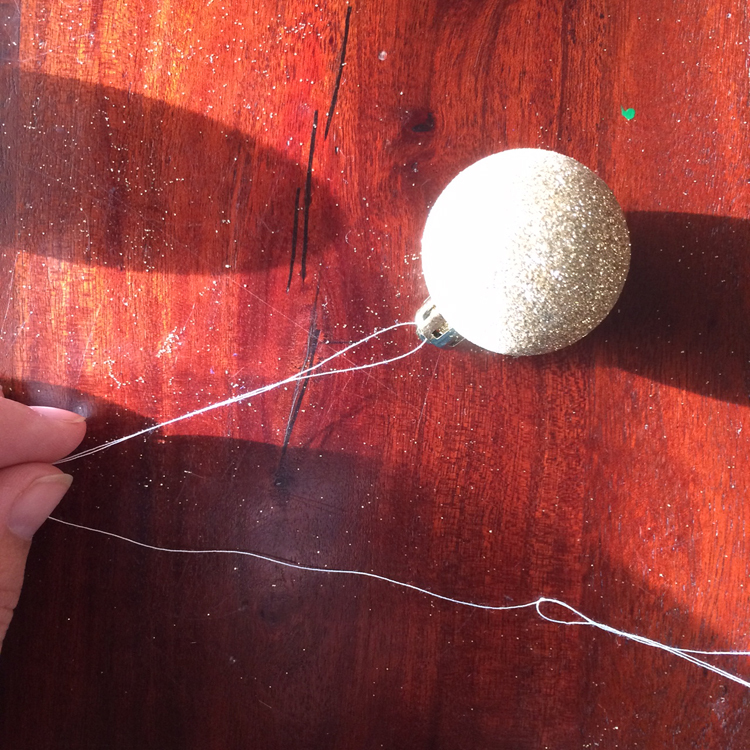 This photo shows how I was able to knot the gold ornaments in place and its a simple technique you can use on any of these garlands. 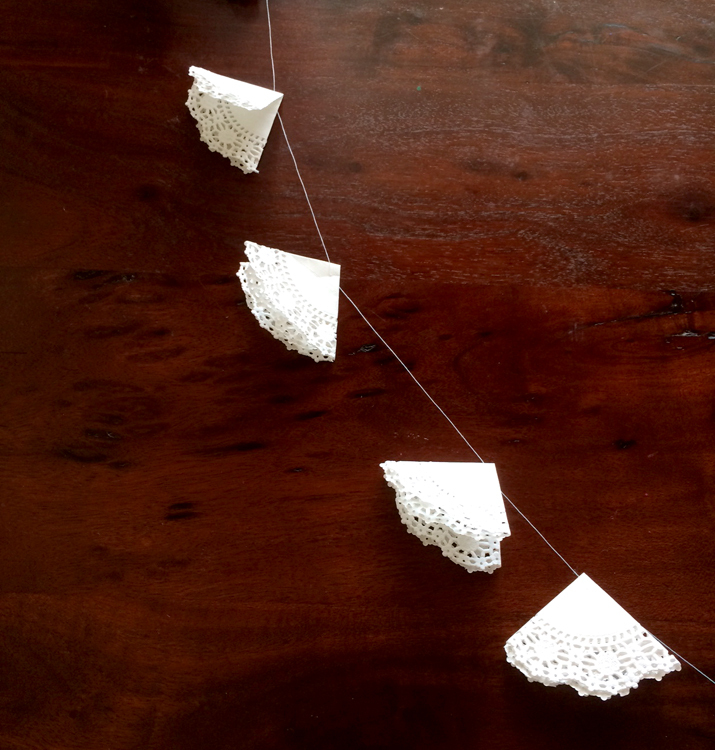 To complete the doily DIY garland, start by folding the doily in half and then in half again so it is a quarter of its original size. 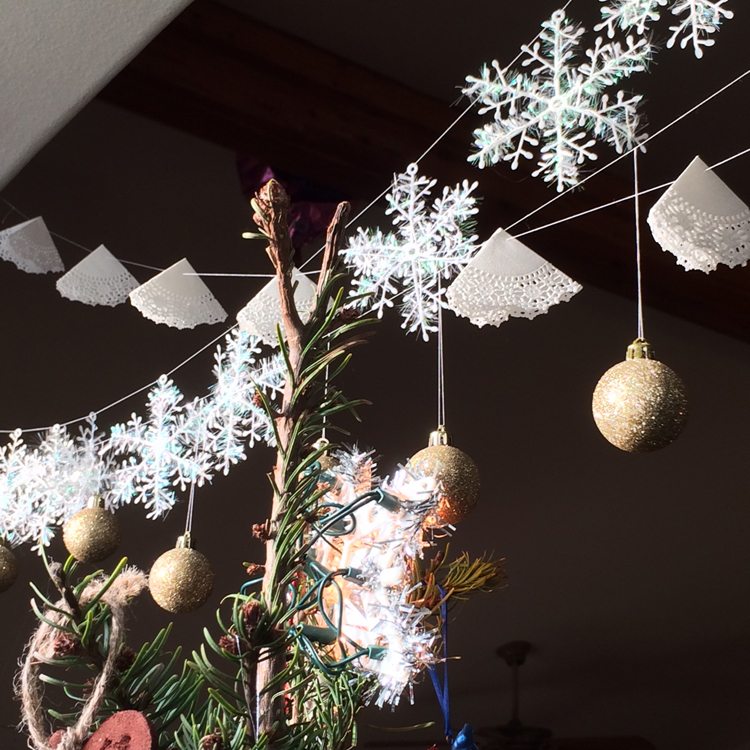 Next, simply string the folded doily onto a thread in similar fashion as with the other ornaments and cotton balls. After you finish the garlands you can sting them up above your Christmas tree or over a window or console table. I hung my four garlands in varying heights, layering them around my Christmas tree. I really love how they ended up looking imperfect and a little natural to frame the Christmas tree. Lots of fun with this family DIY project. Don’t forget to place any etsy orders by Monday, to make it in time for Christmas! All mugs, cards and prints come gift wrapped and ready to give for Christmas! Simple and elegant! Great idea!